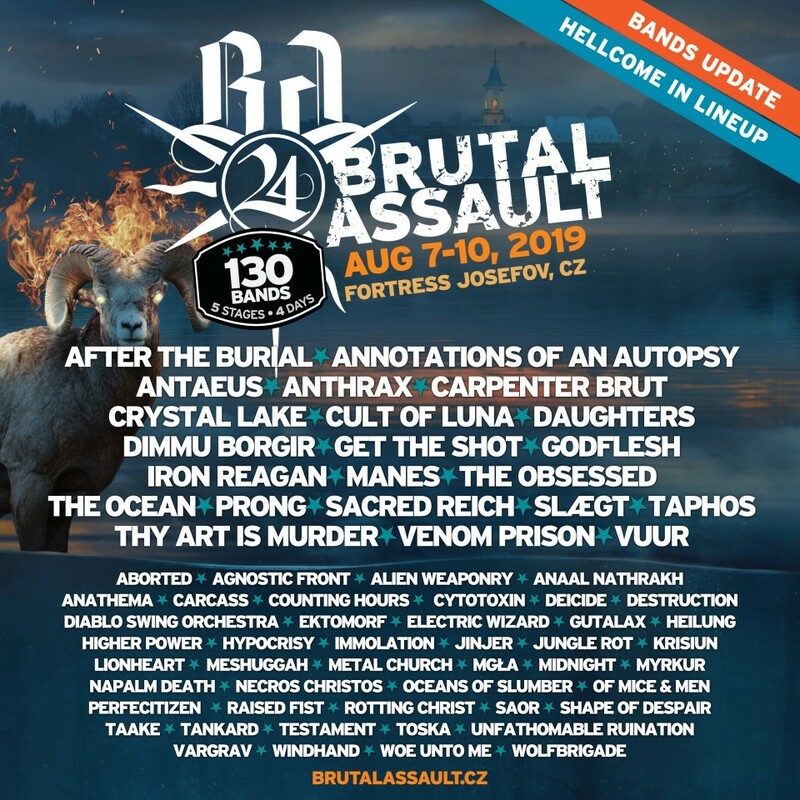 The 24th festival of extreme metal music Brutal Assault to take place on August 7-10, 2019, in Jaroměř, Czech Republic. The festival has recently announced a new bunch of bands, including Batushka (Poland, black metal) and Emperor (Norway, black metal). It also became known that "for organizational reasons", the previously announced act Dimmu Borgir won’t be able to perform at the upcoming event. Order tickets to the upcoming Brutal Assault festival here. Line-up festival at the moment: ABORTED, AFTER THE BURIAL, ALIEN WEAPONRY, AGNOSTIC FRONT, ANAAL NATHRAKH, CUSTOMS, ANATHEMA, ANNOTATIONS OF AN AUTOPSY, ANTAEUS, CACHES ASTRA, CACHTS, CARCASS, CARPENTER BRUT, COUNTING HOURS, CURTS, CITS, CUSTOMS, CUSTOMS, ANTHRAX DIABLO SWING ORCHESTRA, EKTOMORF, ELECTRIC WIZARD, EMPEROR, GET MIDNIGHT, MYRKUR, NAPALM DEATH, NECROS CHRISTOS, OF MICE & MEN, OCEANS OF SLUMBER, PERFECITIZEN, PRONG, RAISED FIST, ROTTING CHRIST, SACRED REICH, SAOR, SHAPE OF DESPAIR, SLGT, TAAKE, TH, , THE OCEAN, THY ART IS MURDER, TOSKA, UNFATHOMABLE RUINATION, VARGRAV, VENOM PRISON, VUUR, WINDHAND, WOLFBRIGADE and WOE UNTO ME.